Joshua Kipkorir crossing the finish line. 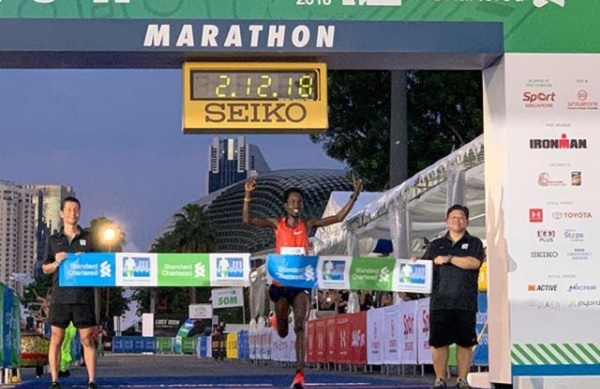 Singapore, Singapore | AFP | Kenyans finished in the first 17 spots of the men’s Singapore marathon — with winner Joshua Kipkorir completing the race about half an hour quicker than the fastest non-Kenyan. 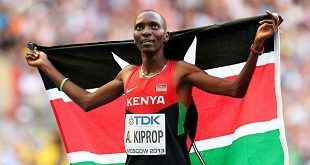 Kipkorir — 24, and competing in the Singapore marathon for the first time — finished Sunday’s race in two hours, 12 minutes and 20 seconds, the second-fastest time in the event’s history, according to organisers. Felix Kirwa was second, a minute behind Kipkorir, while Andrew Kimtai was third. The fastest non-Kenyan was Singaporean runner Soh Rui Yong, lagging far behind the winner, with a time of two hours, 41 minutes and 49 seconds. Kenyan runners also dominated the women’s event, bagging the top five spots. Around 13,000 people took part in the 42-kilometre (26-mile) race. 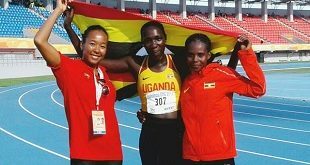 The astonishing results underlined the dominance of Kenyans in marathons, with even Singapore’s tropical heat and humidity proving no barrier to success for runners who typically train at high altitudes. 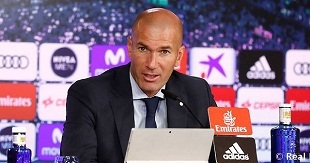 Last week Kenyan athlete Eliud Kipchoge — who has been acclaimed as the greatest marathon runner of the modern era — won the International Association of Athletics Federations men’s 2018 award. He has dominated marathon racing since making his debut in Hamburg in 2013. The Olympic champion set a new marathon world record in Berlin in September with a time of two hours, one minute and 39 seconds. The best way to compete with Kenyans in a marathon is to be a Kenyan. #SingaporeMarathon was super crazy! It’s historic! We did a clean 1-2-3-4-5-6-7-8-9-10-11-12-13-14-15-16-17 sweep on the men’s race.